Save thousands by refinancing your federal and private student loans with our network of banks and credit unions who want you to succeed. You could be saving thousands of dollars when you refinance your student loans. Many borrowers are eligible to refinance but don’t know where to start. The first step is to get familiar with how student loan refinancing works. 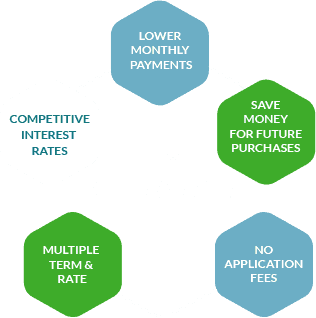 You still have to qualify for a loan to refinance. However, the idea is that over time your credit score has improved and you are now bringing in a steady income with the degree you got. A better credit score could mean more attractive loan terms and rates. With a steady income, you would also be viewed as a lower-risk refinancer. You would need to carefully consider when refinancing federal student loans though because they often come with benefits, such as loan forgiveness in certain career paths. When refinancing, you’d lose those student loan benefits—so decide whether or not you’d use any of them before refinancing. Check out our student loan refinancing calculator to see how much you could be saving. When you’re ready to get started, we are here to help with your student loan refinance through our network of lenders! Does it matter if I graduated and where I attended school? You must have completed an associates, undergraduate, graduate or doctorate degree from a Title IV eligible school to be eligible for student loan refinancing.